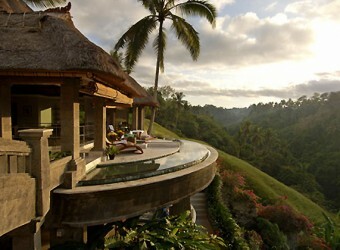 Bali Spa It is a spa of the juxtaposition in high-class resort "The Viceroy Bali" built in the ravine of Ubud. Relaxation and beauty pursuit of Swiss famous spa specialist produces. They focus to health and meditation and offer effective mind & body treatment. Blowing of ravine wind overflow in a feeling of opening and invite to the world of fresh healing. Enjoy lunch at Cas Cades Restaurant. Enjoy dinner at Cas Cades Restaurant. Yoga is handed down as enhancing health and removing physical and psychological tiredness since thousands of years ago. You concentrate on your mind and make it calm, and remove daily stress. Is the use of the foot as a body map to identify and ease organ or nervous system traumas. This massage focuses entirely on the foot which corresponds with particular body parts, organs, muscle and energy meridians which are alternately stimulated. This traditional Balinese village massage is a firm fingered and palm massage. It was this massage technique which the village members practised for centuries to help relieve muscle pain caused by working long hard hours in the rice fields. This endearing massage will relax those weary muscles, mainly the back. Harmony Duo is a four hands massage with two therapists working in tandem to gently ease the body into a state of total relaxation, this special massage employs a technique to rejuvenate tired muscles and improve blood circulation. Lembah Spa offers Intracueticals products endorsed by Madonna and other Hollywood stars as the ultimate facial treatment, where nature is often unkind to skin Intracueticals works extremely well when applied via our oxygen therapy machine to reach deep down into the lower epidermis layers so repair is accelerated. The Atoxelene treatment support product use a natural amino peptidecomplex to smooth the skin and significantly diminish the appearance of fine lines and wrinkles – the skin instantly looks smoother and feels tighter and firmer. The rejuvenate facial support products immediately hydrate , builds skin integrity, increase firmness and luminosity reduces the appearance of fine line and wrinkles - the skin instantly looks younger and tighter with a visible lift. 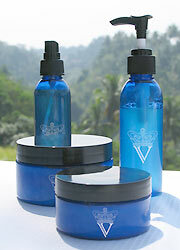 Opulence Facial safely and natural treat the cause of uneven skin tone for healthy functioning radiant skin. Opulence support products combine botanical skin brighteners and super concentrated Vitamin C to brighten skin and balance skin tone - the skin instantly looks more radiant and luminous. This facial that everyone is talking about – the ultimate in skin rejuvenation and instant visible results. The Rejuvenate and Atoxelene work together to significantly reduce the appearance of fine lines and wrinkle while tightening and firming for more defined facial contour. This package is created by the concept of “Seeking of Beauty” for women. Surrounded by fragrance of flower, a therapist provides treatment for smooth and soft skin, brush up inner beauty, remove fat and refresh body and mind. This package is created by the concept of “Psychological Relaxation” for men. The treatment uses spice, vanilla, coffee, cocoa, clove, etc. with good fragrances that has effects of relaxation and relief muscle tense. You can experience deep relaxation not only external but also internal. This is the special package that is including in one of benefits for guests staying in Viceroy, and the same special treatment package is available for spa guests. 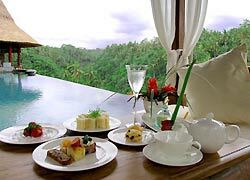 The package includes Balinese Massage at first, remove old skin by Balinese Lulur, Yogurt Pack, and Flower Bath. At the end, please enjoy beautiful scenery with fresh fruit juice. Need 1 week prior transfer payment. The bank account is Japanese bank and all bank charges be paid by customer. Better than I thought. I think the package is available at a reasonable price, it includes body massage, scrub and face care. It was a head to toe full body massage. I may be addicted to this massage.